Off Grid 17 is a different kind of conference, where through a series of curated events and experiences we will explore how experiential design connects people to place. Travel to Australia and New Zealand, stopover in any of four cities, meet up and make an experiential journey to Wellington for a two-day experience design conference like no other. At Off Grid 17 your journey fuels the conversation and Wellington itself becomes the auditorium and nexus of exploration into how we think about and develop the practice of experience design. Start each day with the invited speakers at the Provocation sessions, then extends your Experiential Journey as the conference moves around the city for you to participate in the Open Format sessions. Later bring your experiences back to the evening network parties. Travel straight to Wellington or slow your journey down and stopover in Sydney, Brisbane, Christchurch, or Auckland. Explore one or more of these cities with local designers who will show you around and suggest sites that explore experiential design. 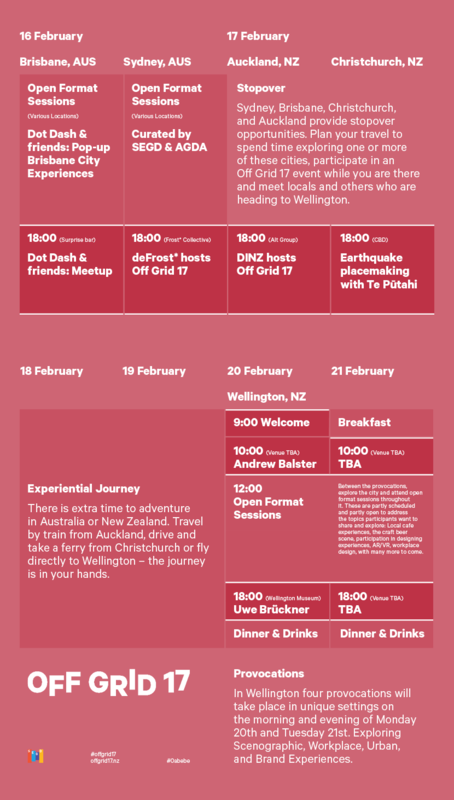 Begin networking with participants who are heading to Wellington at the evening Off Grid 17 events. Add some holiday to your conference and make an experiential journey over the weekend to Wellington. Travel by scenic train from Auckland, drive and take a ferry from Christchurch or fly directly to Wellington – the journey is in your hands. Travel with local designers and explore experiential design together. Provocations take place in unique Wellington settings on Monday and Tuesday morning. Four provocateurs have been invited to address: exhibition, placemaking, workplace, and brand experiences. The Open Format allows you to explore the city through sites, events and presentations proposed by locals and participants. The agenda is open to addressing the topics you want to share and explore: local cafe experiences, the craft beer scene, participation in designing experiences, AR/VR, workplace design and more. Each evening Off Grid 17 brings everyone back together again, to share stories, experiences, and discoveries at the network parties. Unusual locations that help extend the exploration of experience design. Off Grid 17 tickets are inexpensive and provide access to the Provocations and Stopover events. The Experiential Journey from Stopover events to Wellington is self-directed but takes place after participants had a chance to link up. Some Open Format sessions may be associated with admission or travel costs, and Stopover events may charge for participants that do not have Off Grid tickets. 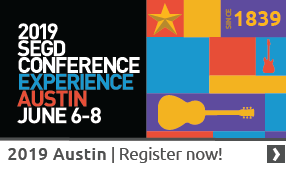 Reserve tickets here.SEGD student members attend for FREE! Click hereto join SEGD. Then click hereto attend Off Grid 17. Off Grid 17 is an international event from SEGD. Supported by the Designers Institute of New Zealand, and endorsed by Ico-D.
*Don't forget: the 2017 SEGD Conference Experience Miami is June 8-10, 2017. Join us! This is it! We are officially less than two weeks away from Off Grid 17. The event will launch on February 16 in Sydney and Brisbane, continue in Auckland and Christchurch on February 17 and culminate in New Zealand on February 20. See the detailed Conference Schedulefor February 20. Nick Kapica, 2017 Off Grid Conference Chair and SEGD's Wellington, New Zealand Chapter Chair discusses the idea behind Off Grid, a new type of event for SEGD which invites you to go on a journey discovering new cities and cultures. You will observe how experiences are created in environments other than the ones you are used to. Finally all participants come together to discuss what you learned about experiential graphic design. It's an immersive real world learning experience.